Helping people get well and stay well are the hallmarks of the nursing profession, and nursing continues to evolve as our world changes. Nurses are a critical partner in all aspects of patient care and good health. Today's nurses are trained for any role in which they may have an interest, or for which there is the greatest need. Whether it's critical care, holistic, geriatric, pediatric, emergency and trauma, genetics, occupational health, wound care, forensic nursing, (and many more) nurses are at the heart of healthcare. Few, if any, other professions offer the variety of career opportunities as nursing. Whether a nurse wishes to work in a hospital setting, see patients of a particular health condition or age in home healthcare visits, or travel to other countries to work with various populations, a degree in nursing can open many doors. There are many points of entry into nursing. Most people pursue a 4-year Bachelor of Science in Nursing (BSN) program from high school, while others choose to begin their nursing careers with an Associate Degree in Nursing. For those who are seeking a career change, and already have a baccalaureate degree, the Second Degree Nursing program may be a great option. 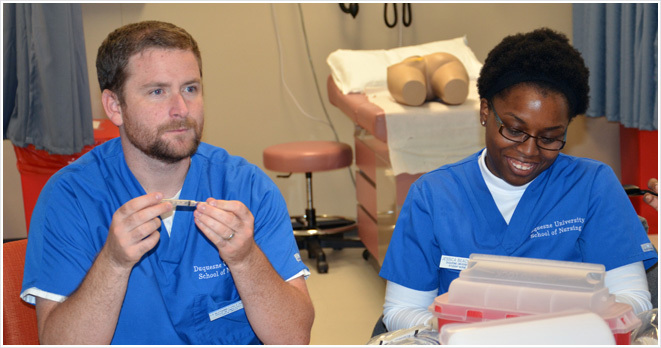 Through the Second Degree program, one is able to earn the Bachelor of Science in Nursing (BSN) degree within 12-16 months, assuming all pre-requisites are complete prior to starting the program. According to data published by the U.S. Bureau of Labor Statistics, employment for nurses is expected to increase by 16% by 2024, which is faster than the national average for all other occupations. Those with the Bachelor of Science in Nursing (BSN) are expected to have the greatest job opportunities. Anyone seeking a career in nursing should research programs and pathways to determine what works best for them. The Duquesne University School of Nursing offers excellent opportunities to enter this exciting career. Contact Gina Plocki for more information, 412-396-6534.